UPDATE: A more recent post updates both GDP and employment information through 2012 Q3. With the release of preliminary European GDP this morning, now is a good time to update the International GDP Comparison graph. The first graph is our standard major economy graph in terms of real GDP changes since 2008q1. Three new graphs follow that. 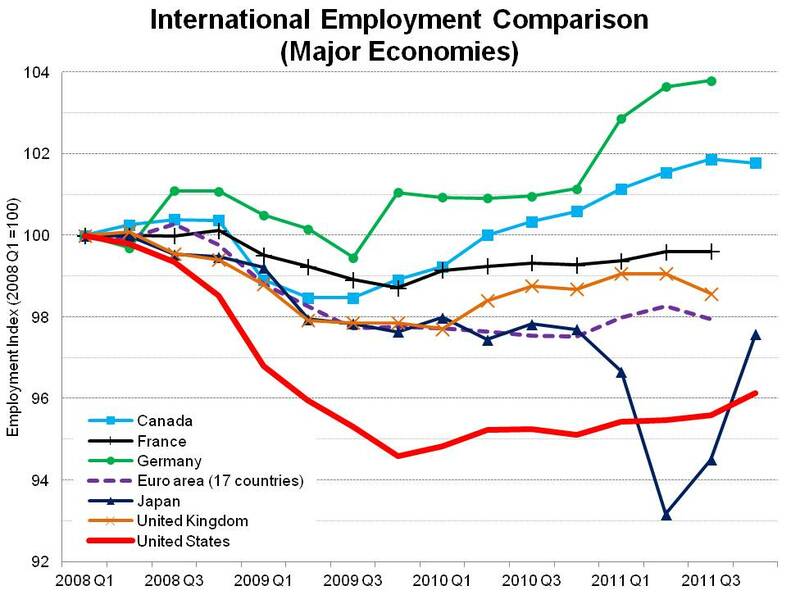 The first new graph is the employment changes by the same major economies since 2008q1. 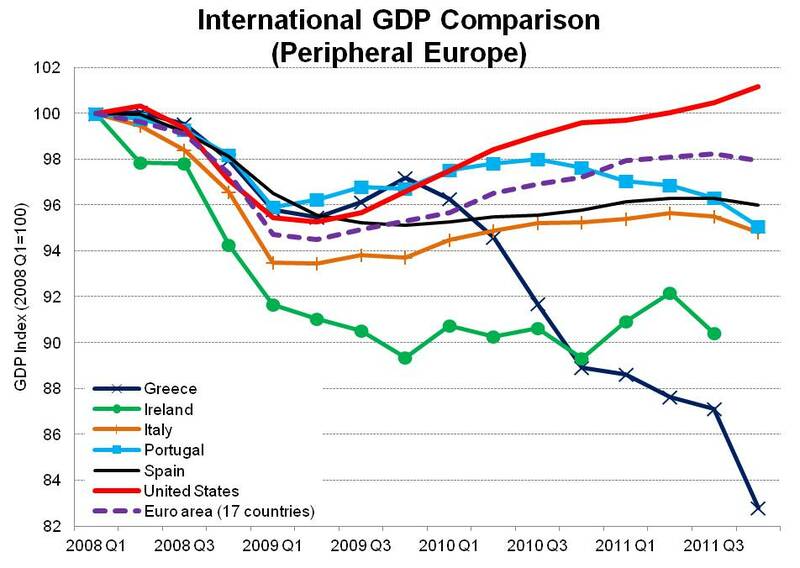 The last two graphs show real GDP and employment changes for the peripheral European economies. Most GDP data is through 2011q4 while the majority of the employment data is only through 2011q3. 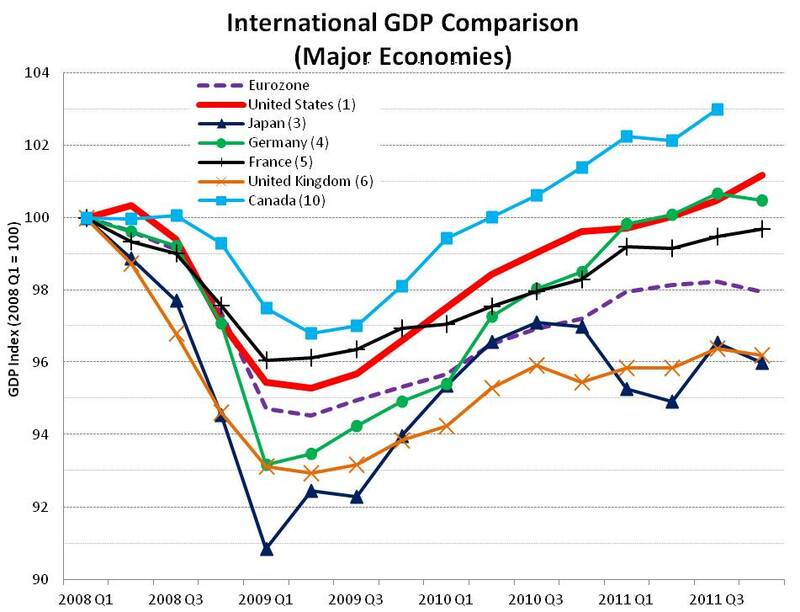 First up are the real GDP changes across major economies since 2008. All data through 2011q4 except Canada which will release q4 GDP on March 2nd. Canada, Germany and the U.S. have all surpassed previous peak GDP levels and France is nearly back. Most recently, Germany, Japan, the U.K. and the Eurozone overall all experienced contractions in real GDP in the fourth quarter. In terms of employment, the countries have undergone different experiences in recent years. Germany and Canada have actually added jobs . Germany in part due to its work-sharing program (Kurzarbeit) where employees are not laid off, however their hours are reduced with some government support filling in the lost wages. Canada in part due to its construction/housing boom. Prior to Japan’s seismic disaster in early 2011, which clearly resulted in significant levels of job loss whoever they have mostly been regained, the U.S. was by far the worst performer across major economies. While some of the loss was certainly due to our more flexible labor markets and the fact that the U.S. was the epicenter of the financial crisis (both in terms of the underlying mortgages and construction boom but also being a major financial hub), the fact that the U.S. lost significantly more jobs is certainly a topic worth further research. The third graph shows real GDP changes for the so-called PIIGS plus the US and Eurozone overall for comparison purposes. Clearly the peripheral European economies suffered much worse recessions and are struggling to recovery (if at all). 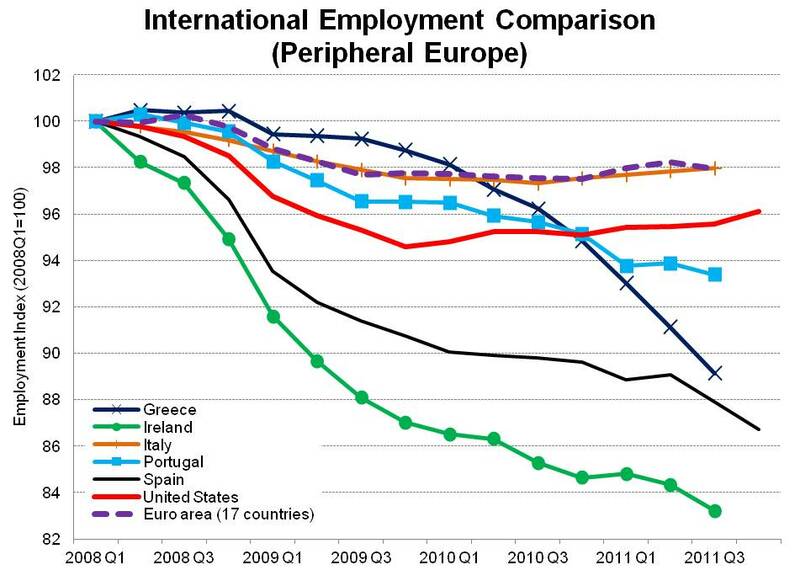 Just as their economies continue to struggle, employment in these countries has largely yet to stabilize or recover. Italian employment has begun to grow slowly and Portugal’s labor market is showing potential signs of stabilization however job losses continue unabated in Greece, Ireland and Spain. Overall, it is interesting to note the differences in economic performance during and after the Great Recession across the international community. In particular, the dichotomy in U.S. GDP versus U.S. employment is striking. While U.S. GDP has outperformed most other economies, U.S. employment looks more similar to peripheral Europe than it does to most other major economies. Now, the recent labor market news in America is certainly encouraging, however we have a much larger gap to recover than the other major economies. The majority of the data comes from the OECD database. This is a very interesting blog. I have been studying jobs scents 1999 although I specialize in telecommuting jobs & businesses and freelance & contract jobs and they have been on a rise where transitional jobs & business have been dropping scents the 2008 recession. My above comment was posted by the wrong email address.